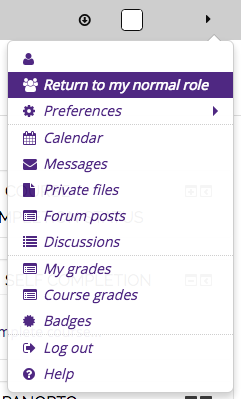 You can temporarily change your role in a Moodle course to view the course as a student (or other role) might see it. 2. Select the "Switch role to..." option under the Administration Block. 4. 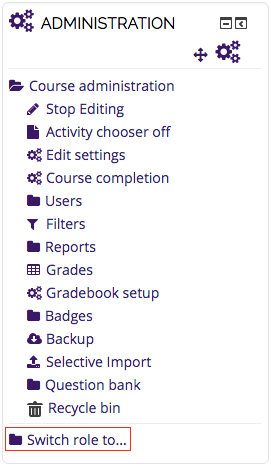 Your course front page will now change to the view that your students see. Any items and links that you had hidden from your students (shown red with the indicator (hidden) in the Instructor's view) will now be invisible. You will also notice that the Administration block only has two links, Grades and Profile. To return to your normal view as an instructor, put your cursor over your name in the upper right corner of the screen and click the "Return to my normal role" button.